The Planted Tank Forum > Specific Aspects of a Planted Tank > Fish > Fin Rot: When to do a salt bath? Fin Rot: When to do a salt bath? I learned fin rot can be pretty fast and today he has another small chunk missing with red edges. It looks like a moderate case, since his tail fin looks shorter than it usually is. 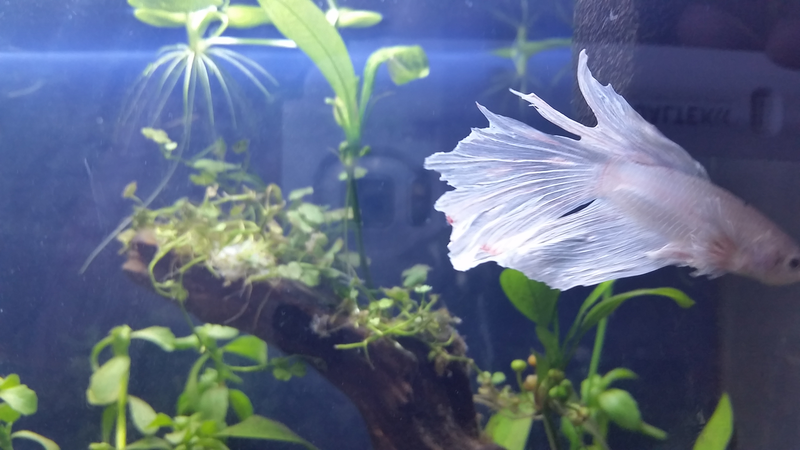 I read that water changes can often help stop fin rot in its tracks, which I will do daily, but I am worried as to when I should do a salt bath. I read that you should do it at least two consecutive days in a row (could not confirm with multiple sources of research) and tomorrow is a work day (long hours, not enough time to be home). Question: I read how you do a salt dip, how do you do a salt bath? Is it just less than 5-8 minutes? I hear a bath is less risky than a dip. Answer: A lower dose and prolonged exposure to salt in the tank is a salt bath. You add 1 tsp aquarium/non-iodized salt per gallon in dissolved water into the tank. Question: How many days consecutive do you do a salt bath? Answer: 24 hours to 10 days, depending on why the salt bath is needed. Question: Should I do it today/now or wait a few days? Answer: If the fins are rotting quickly, sooner is better. Question: How many water changes a day? Can I do a 50% water change daily or do I need to do two 25% water changes spread out? Answer: Daily is fine, 25% minimum, 50% is preferred. Add back salt for the amount taken out each time. Question: Once 10 days have passed, how often should the water change and salt baths be? He has had some faint red streaks in all his fins for months but I figured it was just his coloring coming in. Now I'm wondering if it's been a sign of stress all along. A salt bath treatment consists of a continuous low dose of salt added directly to aquarium. With this you would add 1 tsp aquarium/non-iodized salt per gallon for 10 days. Make sure to dissolve the salt first in a cup of aquarium water before adding to aquarium so that the Betta is not burned by direct contact with salt. Each time do a water change ( daily is best) add back amount of salt taken out. For instance, if do a 50% water change, add back 1/2 dose per gallon of salt. If you are seeing rapid changes in fins from rot then I would go right to the salt treatment. Or, if the changes to fins have been over time and you want to try water changes first- that's fine too. If do water changes alone, do so for 5 days and if no improvement then go to salt treatment. Salt is very therapeutic for Bettafish, much more so than for many other species we keep in aquarium-- so it will not harm, only benefit. Ryan Mosby and RCB like this. I figured a bath would be brief like a dip, in a quarantine; I didn't know it was done inside the tank itself. 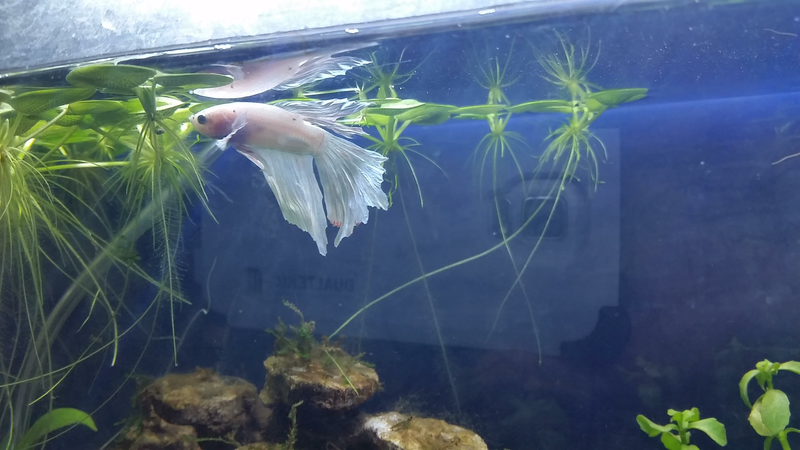 I'm worried my plants will suffer if I dose the tank directly, but then, I can always get more plants--there's only one of my betta. #1. How many water changes a day? Can I do a 50% water change daily or do I need to do two 25% water changes spread out? #2. I do the salt bath once a day, correct? I was thinking right after a water change--I would reduce the dosage based on the amount of water removed, as you said. I just performed a 50% water change so I'll add the salt now. 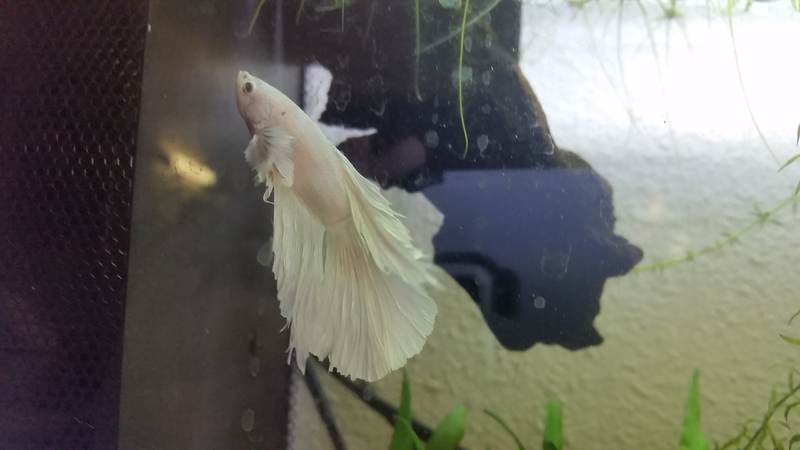 The fin rot was very sudden and progressed over night to the pictures above, so I definitely would like to act fast and prevent it from getting to his body. A lower dose, prolonged exposure to salt is considered a bath. It can be anywhere from 24 hours to 10 days. Depends on why using treatment. One water change daily is fine. 25% is minimum ( say if you were busy that day) but 50% daily is optimal. What you are trying to do here is to lower the organics in water column so that the uptake of medication is maximized for the fish. Actually, the salt bath is continuous, but you will be doing water changes daily so you need to add back salt for the amount you take out each day through water changes. I think this is smart. Better safe than sorry. I added some text directly under your questions in italics. Will activated carbon affect the usefulness of the aquarium salt? I can remove the carbon if it does. No, its fine to leave carbon in. @Discusluv Once ten days have passed, how often should the water change and salt baths be? Edit: I realized I messed up the salt calculations. Instead of 5 tsp for my 5 gallon, I initially dosed with 1 Tbs/3 tsp, underdosing the salt bath. Every time I did a daily 50% water change, I put in 0.5 Tbs/1.5 tsp instead of 2.5 tsp. A few days into the treatment his fins stopped getting worse, and the red lining has gone away. Do I dose (at the accurate dosage) and add on a few more days? Good to hear your Betta on the mend. Do the salt bath for 10 days total- the days when used the insufficient amount of salt can be included in this total because you have seen improvement despite that. Then, change water as often as necessary to keep nitrates under 20ppm. Im happy to hear he is on the mend. I had a fish come in with fin rot... I used a salt bath and meds and it cleared up; however it did hurt some of my plants. It was a trepidation time, but its all ok now. @livebearerlove Yeah, I was concerned about the plants, but I figure it's better to replace any that die than risk the health of my betta. At this point I'm trying to figure out how I'll detect further rot or healing if the changes are slow. Some time ago he developed some faint red on his ventral and caudal fins. I went to the forum, concerned that it was blood, and was told it was likely some coloring coming in. I realized he had fin rot when more than a week ago I saw his tail was missing chunks on the edges and lined with a dark bloody color in some areas. This disappeared a few days into the salt treatments, and the faint red on his tail has seemed to disappear too. However, the red seems more pronounced now on his ventral and pectoral fins. Not on the edges, but in the middle of the fins. I still don't know if this is from fin rot or coloring. I know you re being diligent and deserve an award for it at this point.... Those gills look red. I always look at gills- they can say a lot about health. Excessive ammonia, etc. I know for a fact you are testing it. But could you test be old? I say this because: I had Ick once. I was devastated. 6 years later.... another sick fish I didnt quarantine, I thought for sure it was some sort of mouth fungus and fin rot... but I changed all the water over and over in the tank....... she is more than fine now, she is prego! Finally realized it was my KH/GH fluctuations that caused the pH to spike up and down with light and caused stress and led to problems. I corrected it and added a liquid vitamin, and she is wonderfully and strong. Those gills look red. I always look at gills- they can say a lot about health. Excessive ammonia, etc. I know for a fact you are testing it. But could you test be old? He does have some red on his gills, and has for several months. I'm not sure if this is because he's white in color or a sign of high ammonia. What levels would be considered high? I got a new ammonia test and confirmed both it and the older one work. Ammonia was listed today as 0.5. The last water change I did on the tank was two days ago. At this point, I'm not sure if the 0.5 ppm of ammonia is an issue, but I think nitrites might be. I reviewed my parameters for the last two years and found them occasionally recorded as 0.5 ppm. Sometimes the nitrates are also listed as higher than 10 ppm (but lower than 40) though the test says that this range (and the 0-0.5 ppm of ammonia) are still within safe levels. TDS has skyrocketed due to the salt baths. Any ammonia I consider high with delicate fish (or fish with compromised immune systems, elderly, fry). Im my case, I had a tank of 'other people rejects' that I would try to nurse back to health. I allowed my ammonia to get to .25 and my fishhie friends flipped out. I could always tell as they seemed agitated and gills would get red. Without enough plants to use the Nitrates, the nitrates also spiked. So my solution was quite litteraly a water change daily and that gave the biofilter time to establish back to where it was before.... Now they are great, but those same ones are the first to show signs if I overfeed or skip a water change.